The following sermon was preached by Rev. Dr Wilhelm Torgerson in the seminary’s Martin Luther Chapel for the Feast of the Purification of Mary and the Presentation of our Lord (observed 3 February 2015). A newspaper reported that at the new Apple Store in Peking people had started to line up in mid-afternoon, and they stayed through the night. The reason: They wanted to be among the first to purchase the new Iphone 4 that was to be sold starting the next morning. More than a thousand people waited for the store to open. But they didn’t have that many Iphones to begin with, and so the management decided not to open the store at all to prevent uncontrollable chaos. And that really made people angry: waiting all night, and all for nothing! And that is rather disappointing, isn’t it: waiting and waiting, and at the end to find out that it was all for naught. It seems to be a general truth: we don’t like to wait. Whatever we want, we want it as soon as possible and without too much trouble. It is rare that we consider waiting as something pleasant, except maybe the time before Christmas. That season is ending today, on the second of February, forty days after the birth of Christ. We’re usually willing to wait for Christmas because we know exactly when it will take place and how we plan to observe it. But to wait for others to fulfill their promises, for them to do what they had said they would do, well, that’s an entirely different matter. It often leads to frustration and disappointment. Today’s Gospel talks about someone who is waiting. He is not alone in his expectation, so the verses immediately following inform us; many others are waiting like him. They’re waiting not just for a few hours, not only through the night; they have been waiting for many, many years—and they’re still waiting. But they’re not waiting for the newest technical gadget appearing on the market. Rather they wait for something absolutely decisive, so significant for their life that they’re unwilling to leave the whole thing be after the disappointment of a few hours. What are they waiting for? St Luke says: “Looking for the consolation of Israel”, or just a few verses after that: “Looking for the redemption of Jerusalem”. In other words, they’re waiting for God to keep his promise to send the Messiah, the Saviour of his people, who will not only rule over Israel, but lead the whole world to believe in the God of Israel. I can well understand the people’s longing for Israel’s Messiah. It was a time of Roman oppression, when God seemed to keep silent. Their wait had seemed so futile! How long had it been that the people of Israel hoped and waited—and he still had not appeared. And all those who in the past had claimed to be the Messiah had proven to be bigmouthed fakes. But had God not promised in his word that the Messiah would come? And so the pious ones in the land waited—they did not call for a revolt against the Romans, but they relied on God to do the right thing and the right time. And waited. Now it is the old man Simeon that commands Luke’s special attention. Do you recall what was said about him? Simeon was not only waiting like all the other believers in Israel; but we are told that God the Holy Spirit gave him a firm personal promise: the Messiah will come not only in some undisclosed future, no, he will appear during your lifetime, Simeon! And more than that: Simeon would get to see his Saviour with his own eyes! And holding fast to this promise Simeon waited; for how many months or years, I do not know. And I also do not know whether I—or you—would have relied on that promise for such a long time. Did we just image that, with that special promise? Did we make it up? Would we have been that patient? Well, Simeon was; he kept waiting and didn’t doubt that God would keep his promise. And then finally, the day is at hand: the Holy Spirit urges him to be in the Temple on a specific day in order that the promise might be seen to be fulfilled. And so Simeon rushes up to Temple Hill. What does he see there? Not a charismatic star with obvious leadership qualities; not a great orator to entertain the crowds. It’s just—a little baby. A baby that is presented to God in the Temple forty days after his birth; something that had been going on in Israel for more than a thousand years. Nor was the baby’s head surrounded by a halo, and his young parents looked just like the other happy parents that came to the Temple that day. My waiting paid off; now I can die in peace, because Christ is the supreme and most beautiful fulfilment I can imagine for my life. Simeon holding the Christ child in his arms—that’s the exact opposite of those disappointed yuppies in front of the Apple Store in Beijing. These guys were waiting for a status symbol they could show around—and an Iphone really does not serve well as life’s fulfilment. Surely there must be more to life than possessing the latest trendy mobile phone or some other new electronic gadget. Simeon was not waiting for a status symbol. He awaited the One who gave his life hope and meaning and a future—and he was not disappointed. He is carrying in his arms the greatest blessing of his life. But what does this story have to do with us? I think a whole lot. We are actually mentioned in Simeon’s hymn: He praises Christ as “the light for revelation to the gentiles.” Gentiles, people not of Israel, that’s you and me. This story teaches us how God, in and through this baby which Simeon holds in his arms, how God begins to extend his salvation, his redemptive work, to all people everywhere, even here in St. Catharines. We celebrate this festival because we marvel at the fact that the light which this child spreads, no, which this child is, that this light shines into the darkness of our land and of our city, indeed, into the darkness of our own heart. And what happens in our service today is just as unfathomable. As Simeon way back then took into his arms a seemingly helpless infant and praised it as his Saviour, so we will kneel at the altar, before what seems to be merely a piece of bread and some wine—and yet because of the word spoken with the eyes of faith we recognize in these elements the same Lord that moved Simeon to such worship and praise. We, too, have Jesus with us, in us, as he unites himself in his body and blood with all who partake. Such is the power which shines in this “light for revelation to the gentiles, and for the consolation of Israel” and Saviour of the world. God fulfils his word—often in a manner quite different than we expect, and yet often much more wonderful than we thought possible. That’s the message of today’s Gospel! And that, my Friends, leads us back to the waiting Simeon. For him and many before him it had been a long wait. At the same time he knew: After the arrival of the Messiah, those coming after us will not necessarily have an easier time of it. 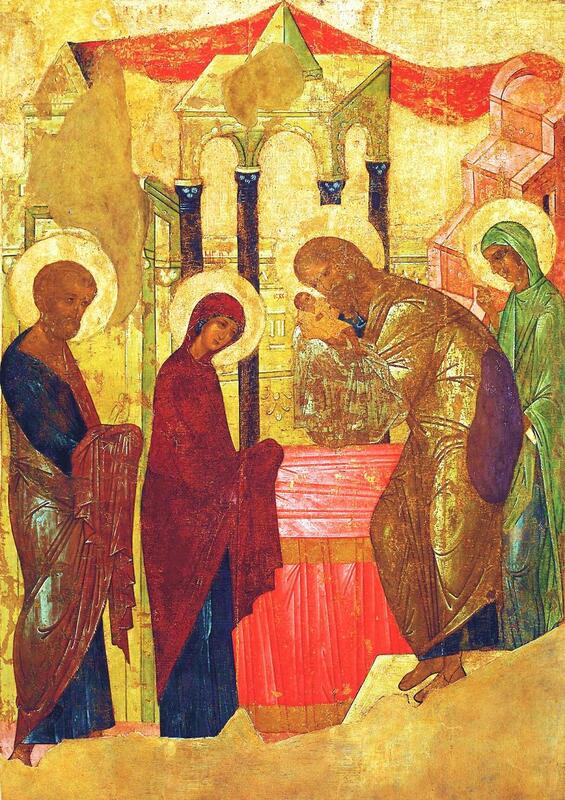 The child which Mary presented in the Temple will become “a sign that is spoken against”. And he says so to the young mother. And that’s the way it is to this day: People will consider it sheer nonsense to believe in this child, or in the adult which it will grow up to be, or to put their trust in him. A great divide will pass through Israel, indeed, through humankind, a divide that separates those, like Simeon, who find in this child the fulfilment of their life, and those who completely disregard this Jesus because they couldn’t care less. What is this child to you, my Sisters and Brothers? And I’m asking that question in view of the many Chinese who had gathered in front of the Apple Store just to get hold of some technical gadget they thought might change their lives. What is this child for you? If we consider this child to be really important for us and our life, then we, like Simeon, will have come to this temple to meet the Saviour, here and now. Someone has carried the promised Messiah into this place this morning. This is where we meet up with the “the light of the gentiles” as his word is proclaimed and his sacred gifts of body and blood are distributed. What could there be legitimately keeping us away from God’s house? What else is there to wait for? Amen.